The Rideau Canal winds its way south from the heart of the capital of Canada to Kingston. This historic waterway travels through woodlands, farms, and towns for one hundred and twenty-six miles on its way to Lake Ontario. Built following the War of 1812, the waterway was constructed due to fears that the United States would invade the St. Lawrence River. The canal then acted as a shipping route between Kingston and Montreal. 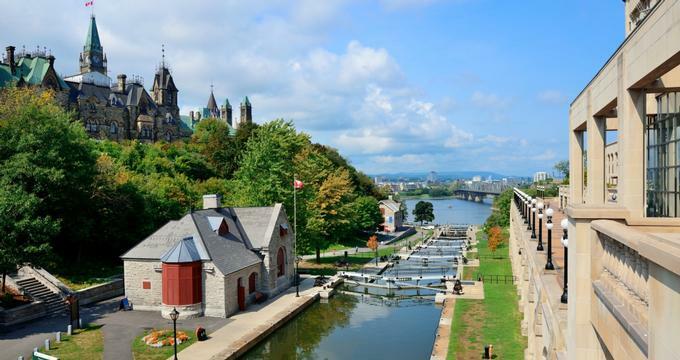 With structures and locks from the nineteenth century, the working Rideau Canal connects lakes and rivers with man-made channels, and is the perfect landscape for looks at Old Ontario and outdoor activities along a waterway that journeys through living history. The canal is accessible by leisurely cruises, paddling, hiking, bicycle, and by road. Self-guided trails are available at many of Rideau Canal's twenty-four lockstations, which also offer space for camping in a tent. Visitors looking for fun on the historic waterway can also explore military structures and historic towns, or ice skate through Ottawa on the frozen waterway in winter. Not only is the Rideau Canal a historic waterway, it is also a route through Ottawa's natural scenery with plenty of opportunity for outdoor fun, from a calm day of fishing to thrilling rock climbing. Visitors can go kayaking for the day, or even paddle the entire length of the canal through hand-cranked locks. If kayaking doesn't sound appealing to visitors, opportunities for cruising in luxury, swimming at a sandy beach, and walking or cycling along waterside paths abound on the Rideau Canal. Campers can pitch their tents beside one of the canal's many locks, or rent an entire lockstation for an over-the-top party. Visitors can also rev a motor or paddle past one thousand kilometers of shoreline. Fishing from rocky outcrops, viewing herons wade and ospreys soar, or chatting with boaters are more the numerous outdoor activities offered along the Rideau Canal. Kayaker and canoeists can spend a day, or a week or more, paddling away down the length of Rideau Canal through the Rideau Lakes. Traveling from Kingston to Ottawa, kayakers and canoeists will have the wind behind them and more downstream. Paddlers can watch the lockmaster crank winches, allowing massive nineteenth century locks to open and close by hand. Visitors can rent just about any boat if they don't have their own, from canoes and kayaks to houseboats and power boats. Camping at one of the numerous lockstations along the historic Rideau Canal offers a memorable experience in a classic Canadian backcountry setting. Campers will wake to bird calls and sleep underneath the stars when they pitch a tent at one of the well-serviced camp sites. Twenty-two lockstations provide camp sites to hikers, cyclists, and boaters for a small fee. Some of these sites are located near beautiful historic towns, while others offer hiking trails. Benches, picnic tables, drinking water, and washrooms are available at the lockstations, as well as grills outside the city limits. Each site is unique, and staff are happy to share with campers the history and technology of the hand-operated locks.